The information here has been gathered from many sources including the official WACOM website. Most of what I have written here can be found on the WACOM site in bits and pieces. Mine is a more comprehensive and explicit summary of what is written there, on other websites, and in forums and customer reviews. As far as I can tell, this code stays the same for the various models in every country. The differences in name and price of these tablets generally reflect size, features and bundled software. All models come with a pen and replacement nibs as well as a usb cable and an installation CD which includes the tablet drivers and a program called Bamboo Dock. In order to use these tablets you must have a usb port as well as Mac OS X 5.8 or later (with Intel processor) or Windows XP, Vista or 7. The size of your working area is possibly the most important consideration when buying a tablet. Remember that, although you may sometimes hold your tablet and work, most of the time it will be flat on your desk. Or you might want it to be portable. In any case, the size you choose should reflect your needs. The Bamboo range only has two sizes – small and medium. This is the size of the Pen, Pen and Touch, Fun Pen and Touch Small, and Manga. This is the size of the Fun Pen and Touch Medium. NOTE: In some countries the tablets are available in both sizes. The thing to remember about these tablets is that the size of the tablet DOES NOT EQUAL the size of the active area. The active area is a lot smaller. The Pen comes with two buttons on the side which you can set to whatever functions you choose. This is available for all tablets. Of this range the only two tablets that come with a pen which you can flip and use the other end as an eraser are the Bamboo Create and the Bamboo Manga. NOTE: I think it is possible with any tablet other than the Bamboo Pen to buy a pen separately which includes the eraser function. But I’m not 100% sure. You can use all tablets, other than the Bamboo Pen tablet which doesn’t have touch capabilities, as a trackpad. With all tablets other than the Bamboo Pen, there are four customisable buttons which you can set to whichever functions you like. NOTE: The programs bundled with the Bamboo Manga are for Windows ONLY. 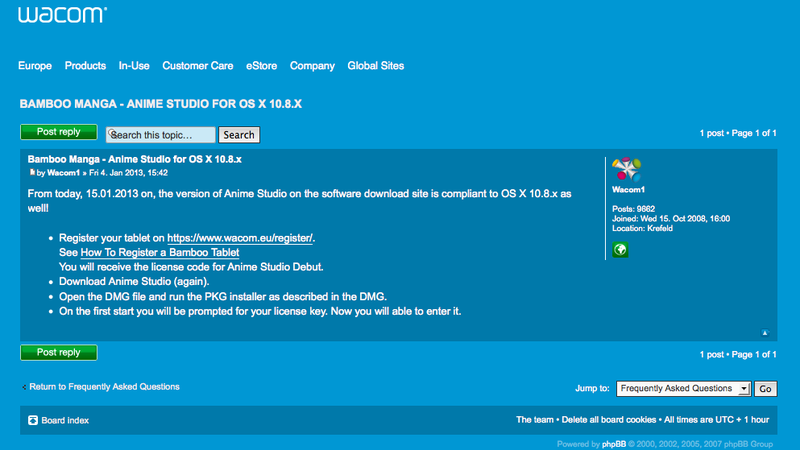 So there have been a few changes since I last checked the Wacom website and now there is direct confirmation of compatibility between the bundled Anime Studio software and Mountain Lion (OS X 10.8.x). I have not seen any other Mac OS mentioned regarding this so I can not comment on whether or not it is now compatible with any previous Mac OS. I also have not seen any information as to whether any of the other software such as Manga Studio Debut 4 and Open Canvas Lite, which was specifically Windows Only before, will now be available to Mac users. Still, I feel that there is a distinct possibility that if the Anime Studio software is available for Mountain Lion then the Manga Studio software should also be available for Mountain Lion as well. As I say, when I picked up the box for the Bamboo Manga a year or so ago, the fact that both these programs were Windows Only was clearly highlighted on the back of the box. However, things may have changed for the better. Let’s hope so. No problem! Thank you for taking the time to comment. This is the best info about this on the site! THANK YOU! Thank you for letting me know you found this useful! Hey, Reina love your posts on the bamboos, really helpful. You mentioned that you have the silver coloured one. Does it match exactly with the macbook pro? or would I be better off with white? Thank You! It’s always nice to be appreciated (^-^) WordPress.com wouldn’t let me post any pictures here so I wrote a longer post with pictures in answer to your question here. But essentially yes, I think they match really well. Hope this helps! I just wrote a post which includes all the things I can remember about when I downloaded and installed the programs. Specifically which program told you that the download key is not valid? Thanks this was really really helpful. Thank god for people like yourself who bother to make these guides. Thanks! Glad I could help ^-^ Happy tablet hunting!